It's anybody's guess about what kind of president Theodore Roosevelt will turn out to be. 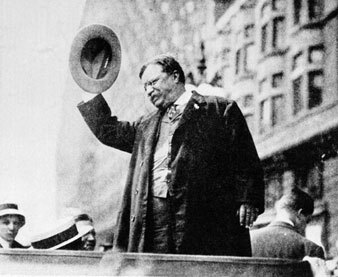 Theodore Roosevelt addressing the people in front of the Congress Hotel upon his arrival in Chicago. It’s anybody’s guess about what kind of president Theodore Roosevelt will turn out to be. This promise does not commit Mr. Roosevelt to a slavish imitation of his predecessor. It does not require him to find out in every instance and in minute detail what Mr. McKinley would have done, and then to do the same things; but it does commit him to Mr. McKinley’s policy of honorable peace with other nations, so far as it has been made clear. In no other way has that policy been made so clear as in respect of the Isthmian Canal treaty. It was reduced to writing and sent to the Senate. After amendment by that body, it was referred to the British Government, and some of the amendments were objected to. Since that time there have been negotiations, which are likewise in writing but have not yet been made public. All that need be said now is that a conscientious adherence by President Roosevelt to the promise he made at Buffalo, will satisfy every patriotic desire as to the Isthmian Canal on this side of the water, and relieve all apprehensions on the other side. The outline of the President’s policy telegraphed from Buffalo is as encouraging for what it omits as for what it contains. There is not a line in it which “breathes short-winded accents of new broils.” On the contrary, it contains the promise to “use all conciliatory methods of arbitration in all disputes with foreign nations, so as to avoid armed strife.” The spirit of Jingoism is not only wanting from it, but is expressly cast out. This is the most admirable feature of the communication. Next to this assurance of peace (for it is certain that no nation is going to seek a quarrel with us) is the declaration of the trade policy which the new Administration will favor, namely, “a more liberal and extensive reciprocity in the purchase and sale of commodities,” and the “abolition entirely of commercial war with other countries, and the adoption of reciprocity treaties.” This is identical with the policy already adopted by President McKinley and advocated by him in his last public speech, as well as in many previous ones. Mr. Roosevelt has been a consistent Republican through all his political career, and has perhaps felt constrained at times to accept a protective policy more extreme than he would have liked. He has never been reckoned, however, as a high-tariff man. His language, on the other hand, respecting the merchant marine will perhaps be interpreted as favoring the Hanna-Payne ship-subsidy scheme. Yet it does not really commit him to any particular method of “encouraging” the merchant-marine. Neither the Republican platform of 1900 nor that of 1896 commits the party to any particular method of doing so. Most gratifying is the closing paragraph in the Buffalo declaration which promises “the placing in positions of trust men of only the highest integrity.” This, we will not doubt, is the firm and honest purpose of the new President. Senator Wellington of Maryland was expelled last week from a club in Baltimore of which he was a member, for some very unfeeling remarks about the attempted assassination of President McKinley, while the issue was still undecided. Those remarks, he says, were not intended for publication, but having been published, he wishes it to be understood that they express his sentiments. The sentiments of his fellow club members are that they do not want his company any longer, and public sentiment concurs with them. Every club has its own rules and regulations concerning membership, resignation, and expulsion, and it is presumed that these rules have been followed in Wellington’s case. If not, he has his remedy in the courts of law. As to the suggestion made by ex-Senator Chandler’s paper, the Concord (N. H.) Monitor, that Mr. Wellington be expelled from the Senate of the United States for the same offence, the Constitution says that each house of Congress may determine the rules of its proceedings, punish its members for disorderly behavior, and, with the concurrence of two-thirds, expel a member. The matter of expulsion is left to the discretion of the Senate, for, although disorderly behavior is mentioned in connection with it, the power of expulsion is not restricted thereby. Evidently the framers of the Constitution intended to place no limitation on the power to expel except that a mere majority should not exercise it.